Today, we decided to splurge a little and bought some rock oysters to make oyster omelette, or "Or Chien", as commonly known in Malaysia. The last time I made this was about three years ago, and it was pretty successful for a first attempt. It's not a difficult dish to make, only that you need to have some plump and juicy fresh oysters and nothing can really go wrong, except that I FORGOT to add oil to the pan before I poured in the batter! I only realised it when I poured the egg over the batter and found that the omelette was sort of stuck to the pan, and no sizzling! Well, never too late to add oil, and I managed to save the dish. Phew! It turned out tasting pretty close to the real thing, especially with the chilli sauce that I made that afternoon. I could have left the omelette to fry a little longer, to crisp it up a bit more. It's a wonderful combination of textures - crispy, gooey, chewy, creamy (from the oysters). 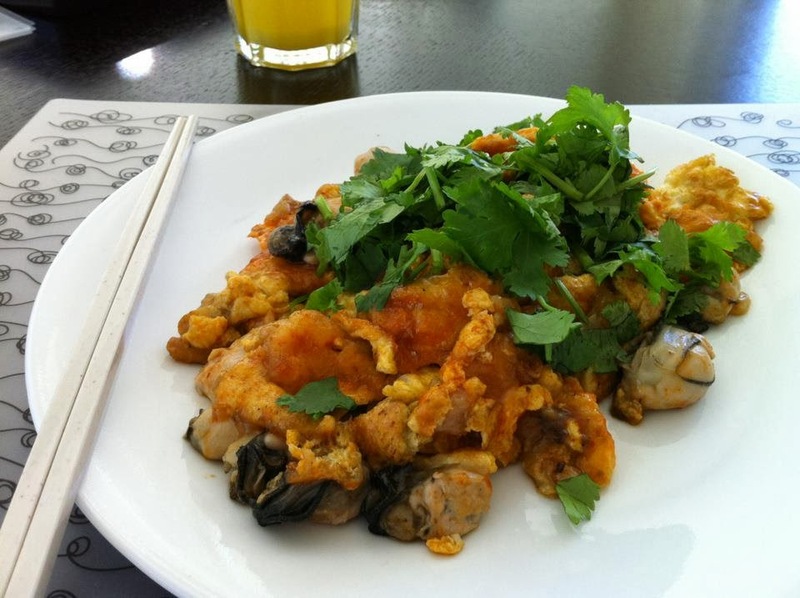 It's one of my favourite hawker dishes! Combine ingredients for the batter until smooth. Place 1 tbsp of the batter into the oysters and put aside. Heat up 2 tbsp oil in a large pan. Pour in the batter and spread it around the pan. Just before it sets completely, pour in the beaten eggs and spread it around with a spatula. Cook on high heat for 2-3 minutes until it starts to crisp up around the bottom and edges. Cut up the omelette into 4 pieces, and push it aside. Add a little oil into the pan, and when it's hot, pour in the oyster mixture. Fry the oysters briefly, and then fold them into the eggs. Season with fish sauce and pepper, and don't overcook the oysters. 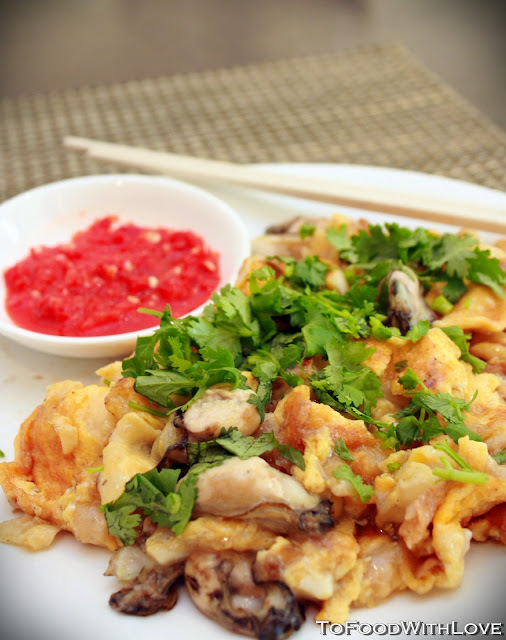 Add sriracha chilli sauce and fold it into the omelette as you're frying. Dish out and garnish with coriander leaves, and serve with extra chilli sauce if desired. Finely blend or pound the ingredients above and taste for seasoning. Serve with oyster omelette.